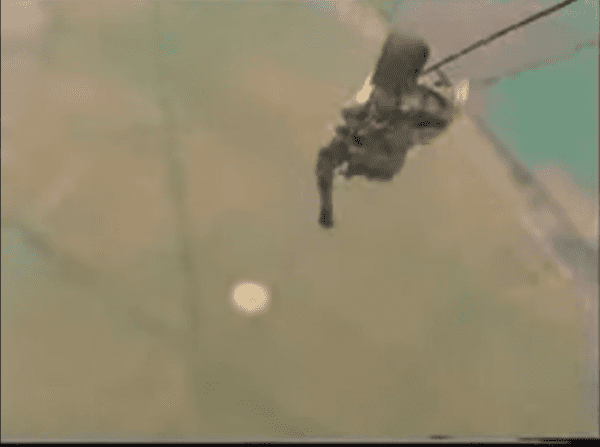 In a near-death experience, an Airborne paratrooper dangles from the back of a plane after a standard jump goes wrong. The soldier’s chute gets caught on the back of the aircraft essentially making him helpless. He is forced to hold on for his life while his fellow soldiers scramble to free him. This might be a worst nightmare for people who are afraid of heights. Luckily for him, his fast-acting fellow British soldiers successfully attached a new chute before cutting the snagged line. This impulsive but smart reaction from his team allowed him to be freed from the aircraft so he could safely make it to the ground. Thankfully, the new chute worked like a charm and the soldier glided away, almost as if nothing unusual had happened. The soldier’s adrenaline was likely pumping more than ever since he barely escaped death. The jump takes place over a drop zone in southwest England called Weston-on-the-Green. The paratroopers can be seen with their arms in a spread-eagle position while exiting the tailgate. 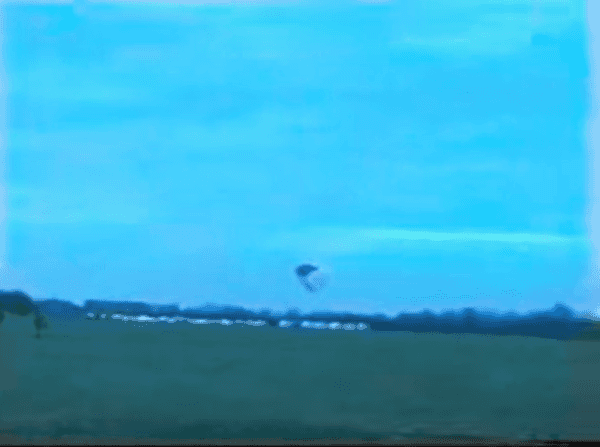 It is highly uncommon for parachutes to fail, which makes this incident even more remarkable. With proper maintenance procedures being put in place, there is no need to worry about running into issues while parachuting. Incidents occasionally do happen and it is always smart to have a backup plan in mind when there is a tangle or something gets stuck. Clearly, there was a backup plan in place since the soldiers instantly addressed the problem with a simple and effective solution. This soldier really owes his life to his team because without their assistance, he likely would have not had many options. The specific parachute that he was using is called a “Static Line Square” parachute, which is the next level up from the “Low Level” parachute. 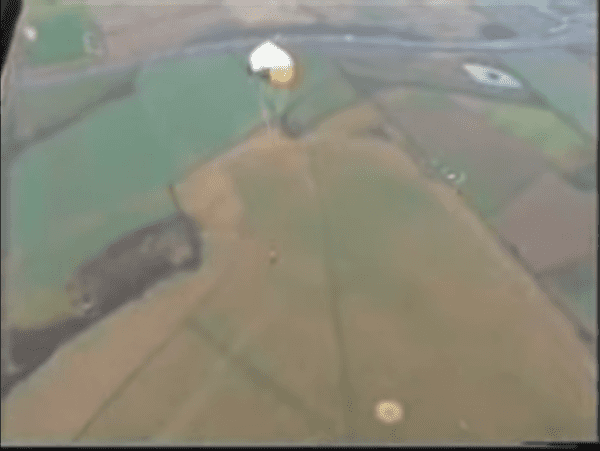 It is common procedure to video record all jumps, which is why there is footage of this dramatic and abnormal malfunction. Jumpers are also trained on what to do in case there is a hang-up with a parachute. The reason why a new chute had to be attached was because the reserve chute is connected to the same pack as the main chute. There are many differences between this and civilian parachuting where there is limited training and the jumper is much more dependent on the instructor.